Heavy duty internal galvanized steel inserts for easy installation of tubular motor plates and external smooth appearance. Same cap can be use on the left (L) and right side (R). Simply fasten the leg on either leg opening. Compatible with small hurricane shutter side rails and 44mm slats, recessed and surface mount track systems. To be used with the elements exterior screen system recessed track and surface mount to achieve widths and heights up to 21ft. Pre-cut for universal crank to be installed. No extra fabrication needed. Unsightly paint chips are a thing of the past now Thanks to our new touch up paint. Restore the beauty of your Solar Screens or Hurricane Shutters Aluminium parts. Our new touch paint bottles are a precise match to our aluminium parts for flawless paint chip repairs. Our focus is to expand our markets. More than half of USA’s free-trade agreements are in Latin America. These 11 markets include Chile, Colombia, Costa Rica, Dominican Republic, El Salvador, Guatemala, Honduras, Mexico, Nicaragua, Panama and Peru. Tariffs in these countries are low, which makes these markets fertile ground for expansion. Our new partners, Consorcio Corporativo Alpe and Esmetsac with headquarters in Mexico and Peru respectively; will be helping us expand our network of Dealers in South America. Setting up distributors in these countries is going to help us become bigger and stronger, faster. We are pleased to continue to grow and make every effort to create profitable business opportunities and generate jobs in every area we get into. Hurricane season is underway. Are you ready? Did you know? In an average hurricane season there are 12 tropical storms with winds of at least 39 mph, six hurricanes with winds in excess of 74 mph and three major hurricanes with winds exceeding 111 mph. We are always thinking of ways to help you increase your profits and to make the most out of this hurricane season, we put together a complete package of support services that includes: marketing materials, free technical support, referral services and web based sales and estimate management software. You can count on us to help you succeed and grow. To join our growing network of Hurricane Shutters, Solar Screens and, Motorized Interior Shading Distributors, contact us today. Note: Hurricane season in the Atlantic begins June 1st and ends November 30th. The Eastern Pacific hurricane season begins May 15th and also ends November 30th. Florida and Texas customers please click here >> to contact our authorized distributor. 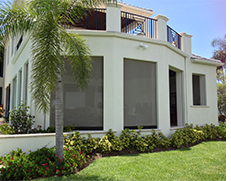 MaestroShield’s electronics put the beauty of your indoor shading, outdoor solar screening, hurricane and security protection roll down shutters into motion. Our state of the art electronics support low data rates, low power consumption, security and reliability. New built-in transformer provides voltage stabilization, eliminating voltage irregularities. Better insulated for premium moisture protection. New built-in transmitter allows for transmission ranges of up to 262 meters. Conveniently tucks into any space and provides protection against power surges or spikes. Mini Receiver can be easily mounted inside the hood assembly. Built-in features such as programming multi-unit controls and the ability to change the direction of the motor’s rotation. All the funtionality of a single channel hand held remote in the palm of your hand. MaestroShield’s Motorized Interior Shade Conversion Kit offers the convenience, control and safety of motorization in one box. Motorizing your interior shade is as quick and easy as 1.2.3. 2) With a couple of simple modifications, manual control is replaced with MaestroShield’s DC tubular motor, crown and drive. 3) Insert motor into motor tube, wire for power and set up control systems. Conversion of manual interior shades into motorized shades can be done in just minutes! Mechanically set limits with dual sided limit access; 8″ long hexagonal limit adjuster tool together with wiring manuals included with each tubular motor. Universal Accessories, Crown and Drive Gears for tubular motor tubes 38mm (1-inch) and over are available. 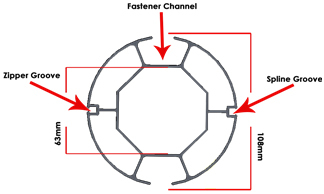 Universal Accessories, Crown and Drive Gears for a variety of tubular motor tubes. Note: Discontinued items due to old programming style. Same great performance at a reduced price. Additional discounts if you order more than 5 items. For more information. please give us a call (239) 596 – 8883. ** Florida residents: This clear-out sale is brought to you in a joint effort with Town & Country who currently supplies your Maestroshield product. We will assit you in the order process with Town & Country. These items are limited and only on sale while supplies last. Thank you! We know you are wondering what’s going on under the hood and we want to keep you in the loop. So here is a sneak peek of what we’ve been working on. Reach taller heights with the NEW 4 1/4″ solar screen motor outer tube. Bigger tube diameter creates drop area for the zipper to drop into when rolling up the screen. This drop area allows for installations of up to 21 ft. tall. Our new extruded rounded hood for solar screens is lightweight and engineered for strength and durability . Its’ sleek design makes it an elegant, yet heavy duty enclosure for our tubular motors. 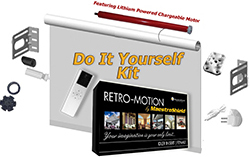 RETRACTABLES by MaestroShield is a Do-It-Yourself battery operated motorized shade kit. This system will provide the flexibility and freedom to create your own retractable. Because our kit is battery operated, NO wiring is required! Depending on usage, batteries need to be changed only 2-3 years. 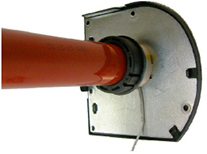 Easy installation – Motorized install is the same as with any regular retractable. Eliminate the need to manually adjust hard-to-reach window blinds. Eliminate dangerous cords and create a safe environment for your children and pets. We know the importance of having every piece of data you need at your fingertips to efficiently manage and run your business. With this in mind, we have invested many hours to custom design a comprehensive sales and estimate management web portal for our dealers, fabricators and distributors. 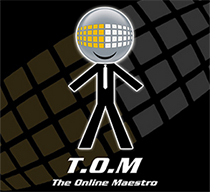 The tools we make available to you were developed to meet your specific needs and, as a result, T.O.M. allows you to automate the sales and job estimate process for our roll down shutters and exterior screens, right from your phone or tablet anytime, anywhere there is an internet connection. Not only our free custom online solution is incredibly easy to use but it will save you numerous hours of work and effort. We are excited to be able to provide this to you FREE of charge. Give us a call today and get access to our top of the line web portal!.